What's Your Deal, Mystery Chrysler-Grilled Alfa Romeo Hatchback? It's always a lucky day when you spot an Alfa Romeo on the roads here in the U.S. But finding a weird, disguised, Alfa mule with a strange Chrysler grille is like finding a four-leaf clover. We were in heavy two-lane traffic heading south on Lauren Canyon, toward the Hollywood Hills, and I somehow managed to get behind the guy and get a couple clean shots of the badge and interesting tail lights. Wanting a shot of the front, with its crazy zebra camouflage, I pulled into the right lane and hoped that traffic would somehow allow me to get ahead of him. As luck would have it, three or four people ahead of me turned off the road, and as I was pulling past I looked over at the driver and he said "Who do you work for?!" (ala "Who does Number 2 work for?" from Austin Powers). I almost laughed, since I was cruising around in my first Gen Toyota Prius. It's lavender. Not my "I'm a car guy" car! The driver mystery car's driver asked to take a picture of Robert so he "wouldn't get in trouble with his boss," whatever that's supposed to mean. What, so a team of Fiat ninjas could track him down later and destroy the evidence before it reached Jalopnik, maybe? Too late for that. At any rate, it's a pretty strange little car. 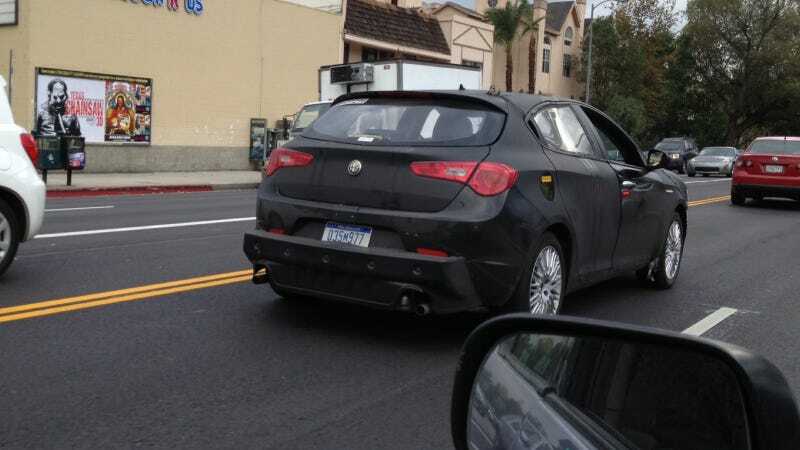 It's pretty clearly a Giulietta hatchback with some heavy camouflage, and a grille from what looks like a Chrysler 200 (née Sebring) tacked on to add to the disguise. Or maybe Chrysler is bringing us a U.S. version of the Giulietta with their own badge on it. Maybe we'll find out more next month at the Detroit auto show. What do you think of this car, and what does it mean for us Alfa Romeo fans in America?